This work explores the construction of cultural identity by setting up a situation wherein one can observe oneself in other cultural frameworks, through the technology of “bridging a gap” called an arch, and a mirror. 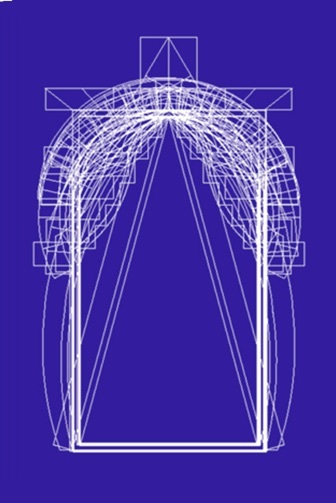 Specifically, the project looks at the development of the structural and, at times, ornamental form of the arch, a basic a shared human technology, but reduced into motifs of distinct cultural identity. 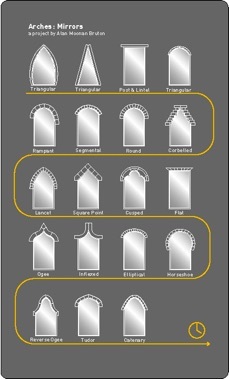 The project catalogs a chronology of the development of arch types, some structurally innovative and some not, though being socioculturally important, and then represents this collection at a non-architectural context as a set of framed mirrors, questioning aspects of superficiality and identity constructions, exploring something of our deeper shared cultural connectedness.